Tele-operation of harvesting machinery has moved a step closer with the successful demonstration recently of an unmanned John Deere 909 owned by Wood Contracting Nelson Ltd. The machine was demonstrated to forest industry representatives in Moutere Forest with the Associate Minister for Primary Industries , Hon Jo Goodhew, attending. With the machine operator sitting in a mobile cabin on the landing , the machine was successfully felling and bunching stems. 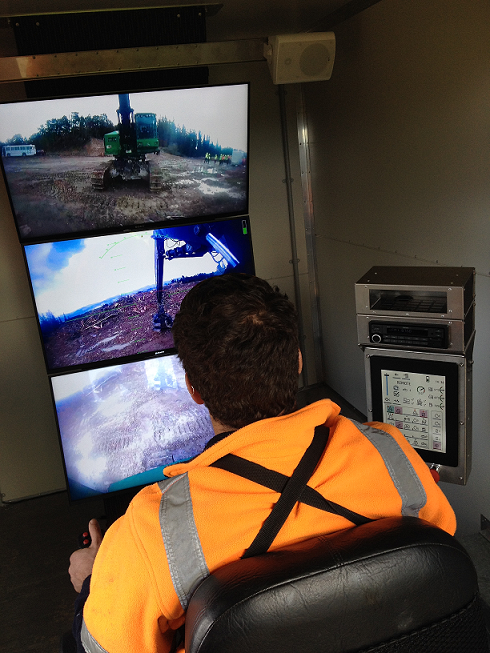 With an array of cameras mounted on the John Deere machine that are displayed on three large TV screens, the operator has a view similar to what would be seen from the cab of the machine. Cable tension on a winch assist machine at the top of the slope can also be controlled remotely. This is the latest step in a six year, $6 million Primary Growth Partnership (PGP) programme between the Ministry for Primary Industries and a consortium of forest companies and contractors led by Future forests Research Ltd. After three and a half years of design, engineering research and development the project is now very close to being commercialised. At the same industry event the tele-operation of a backline harvesting machine was also demonstrated. This installation allows the hauler operator to move the backline machine remotely without the need for an operator in the machine. The purpose of this programme is to make harvesting on steep land more productive and safer. This successful trial of the tele-operated machine is a further step in this programme and adds to other developments that include the ClimbMax harvester, the Cut-over-Cam that provides the hauler operator with a view of the stems they are hauling in and the remote controlled Alpine grapple carriage.